How can we ‘nurture confident disciples to live out their faith seven days a week’? 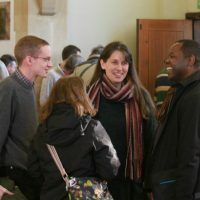 How do churches help individuals to become disciples who can make the connections between their daily life and their faith? How can churches become communities that envision, equip and support their people to live fruitful Christian lives seven days a week? This training day will help church leaders to explore how to make small and manageable changes to their ministry and worship which help these to become more deliberately enabling of the places Christian disciples find themselves for the majority of their time. Using materials and experience from the London Institute for Contemporary Christianity participants will have the chance to explore principles and practices that churches of different sizes and churchmanship have found to be effective in giving people a vision for their everyday lives. This is a chance to inspire members of your leadership team to recognise the possible one degree shift changes to the ethos of church life which will transform the outcomes of Christian discipleship. Individuals are welcome, but it makes sense to bring a group of people who can catch the vision. Hosted by the Department of Mission and Ministry but led by members of the London Institute for Contemporary Christianity. Venue: Trinity Cheltenham.